The rugged, windswept moorland plateau of Kinder Scout is situated in the Peak District National Park one of the most well known mountains in England. There is no actual summit, the part of the moor known as Crowden Head rises to 636 metres (2,087 feet) which is the highest point in the Peak District. The name derives from the Anglo-Saxon 'Kyndwr Scut' meaning water over the edge. Views from the summit of Kinder Scout on a clear day include the city of Manchester and the Greater Manchester conurbation, as well as the Liverpool skyline, Winter Hill near Bolton, and the mountains of Snowdonia in North Wales. The Kinder plateau rises sharply from the surrounding landscape and its edges are studded with rugged outcrops and crags. Weirdly shaped weather beaten gritstone outcrops sit on the southern edge of the Kinder plateau. It takes the form of a large moorland plateau littered with an impressive series of gritstone outcrops including, amongst others, Crowden Tower, Fairbrook Naze, Nether Tor, Ringing Roger and Upper Tor. 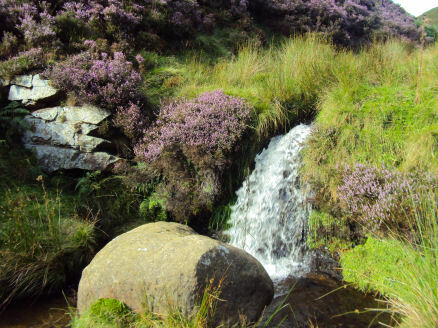 There are the many steep sided cloughs such as Crowden Clough, Grindsbrook Clough, William Clough and Jaggers Clough. 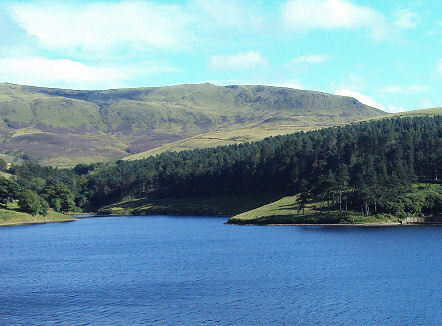 Nearby Kinder Reservoir lies two miles upstream of the picturesque Peak District village of Hayfield at the head of the Kinder Valley. 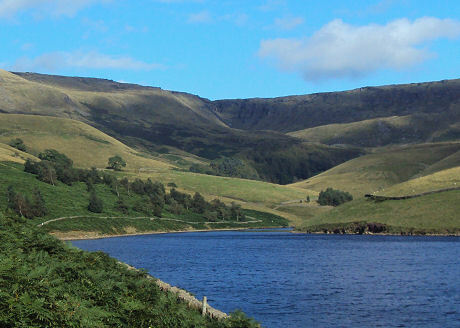 The reservoir is fed by the River Kinder flowing down from Kinder Scout. It was completed in 1911. The Edale Cross lies to the south of Kinder Scout, under Kinder Low and is situated on the former Hayfield to Edale road. The first cross to occupy the site may have been set up by the Abbots of Basingwerk Abbey to mark the southern boundary of their land, which was granted in 1157. The date of the current cross is not known with certainty, although it is thought to be medieval. The Kinder Scout plateau was the subject of a planned mass trespass in April 1932 which Roy Hattersley has described as "the most successful direct action in British history", seen as a working class struggle for the right of walkers to roam versus the rights of the wealthy to have exclusive use of moorlands for grouse shooting. A large number of ramblers (around 400) gathered at nearby Bowden Bridge Quarry and commenced a planned protest walk. 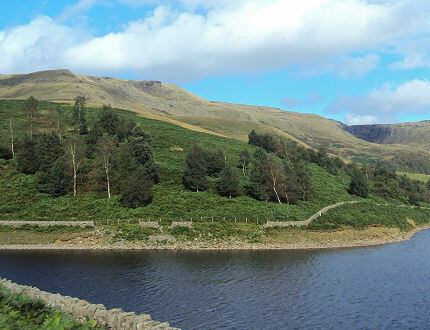 Having reached a s far as halway up William Clough near Kinder Reservoir and en-route for the summit, where they were met by gamekeepers and bailiffs. In the scuffle that ensued a gamekeeper was injured and the walkers continued to the summit where they were met by a further group of walkers from Sheffield, who had traversed the plateau from the Edale side. On returning in triumph to Hayfield a number of the walkers were arrested by the police. Five people were tried at Derby Assizes and were giving prison sentences ranging between 2 to 6 months. The imprisonment of the trespassers unleashed a huge wave of public sympathy and succeeded in greatly aiding their cause. 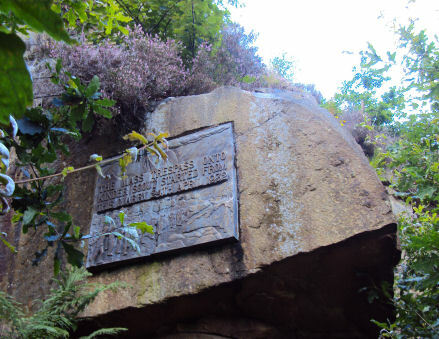 A commemorative plaque at Bowden Bridge Quarry (pictured right) marks the start of the trespass. It was unveiled in April 1982 by an aged Benny Rothman, during a rally to mark the 50th anniversary. Benny Rothman is famous for his leading role in the mass trespass and was imprisoned for his part in it. Kinder Scout is an extremely popular location with walkers and may be is accessed from the nearby villages of Hayfield, up William Clough and Edale Village, up Grindsbrook or via Jacob's Ladder and on to Kinder Low. Once away from the edge of the plateau it is difficult to see any landmarks so a compass, map and knowledge of how to use them are essential for those planning to visit Kinder Scout. 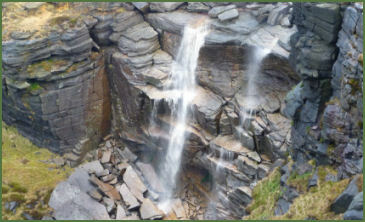 The dramatic Kinder Downfall is the highest waterfall in the Peak District National Park, with a 30 metre drop. 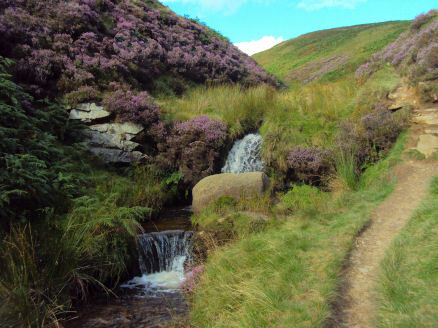 The waterfall is situated on the River Kinder, where it flows down the end wall of the natural amphitheatre of Kinder Scout. The waterfall was once known as Kinder Scut, which is how the plateau derived its name. Under spate conditions it is extremely impressive. When there is a strong westerly wind the water is blown back on itself, and the resulting cloud of spray can be seen from several miles away. On sunny days, colourful rainbows arc over the rocks. Below the Downfall the River Kinder flows into Kinder Reservoir. In cold winters the wind and low temperatures create frozen architectural shapes as the cascading water turns to ice, providing local mountaineers a challenge that can be climbed with ice axes, ropes and crampons. *This walk follows in the footsteps of the historic 1932 Kinder Mass Trespass. Commencing at the pay and display car park at Bowden Bridge near the village of Hayfield, walk in north easterly direction along Kinder Road with the River Kinder to your right. *On reaching a bungalow on the left opposite a sheepwash, cross the footbridge over the river and turn left. Continue on the footpath along the right bank of the river which passes through woodland. *Turn left on reaching a junction in the path and then cross the river for a second time via the footbridge, passing over the outflow from the Kinder Reservoir Dam. 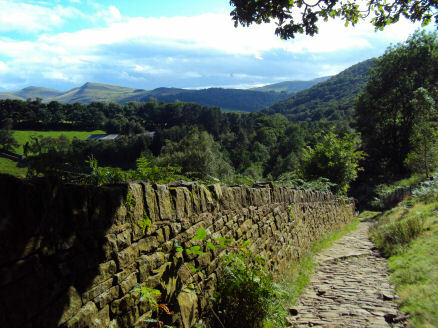 After crossing the bridge turn right and ascend the steep cobbled path to reach the Kinder Reservoir Dam. *Proceed along the footpath path as it follows the shore of the Kinder Reservoir veering left to cross a stile and footbridge into William Clough. Following the path by the stream that courses down via several small waterfalls. The footpath crosses the fast flowing stream several times.
.*Emerge from William Clough onto the col between Mill Hill and Kinder Scout. On reaching a fork in the path turn right to join the Pennine Way and head towards Kinder Scout, Follow the Pennine Way, a pitched path up the steep slope of Ashop Head, carry on along the moorland edge, keeping the steep slope on your right and pass a large cairn. *Continue on, passing weirdly shaped stones, sculpted by the wind and rain, follow the path as it bends to the left to reach the spectacular waterfall of Kinder Downfall. *Retrace your steps down William Clough and past the reservoir to return to the car park at Bowden Bridge Quarry.